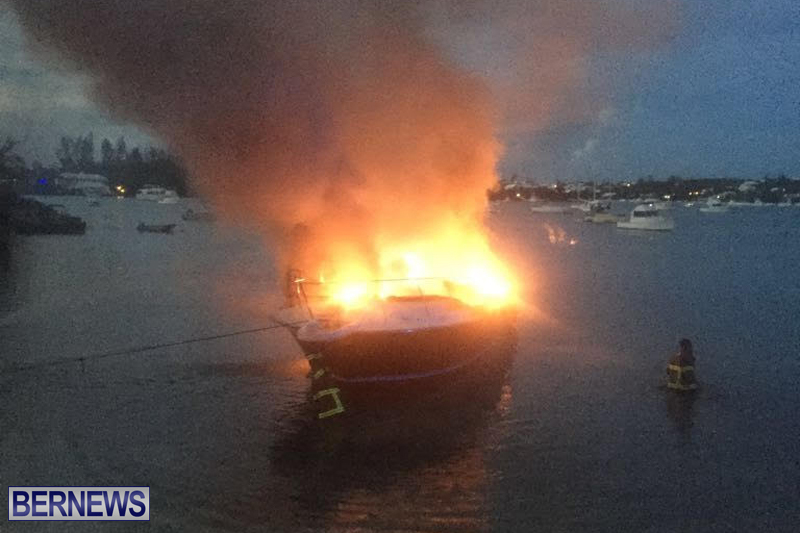 Bermuda Fire and Rescue Service personnel have responded to a boat fire tonight [August 21] in what we understand to be the Ely’s Harbour area in Somerset. It is understood that the boat was secured to a moorings. Details are limited at this time, however we will update as able. 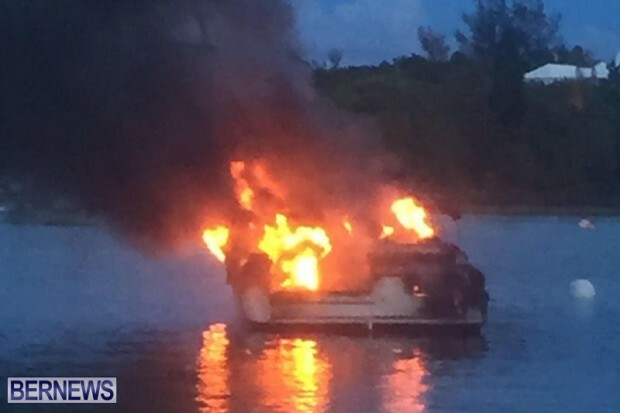 Update 9.16pm: The BFRS said that at approximately 7:29pm this evening, they responded to the boat fire that could be seen from Ely’s Harbour in Sandys. 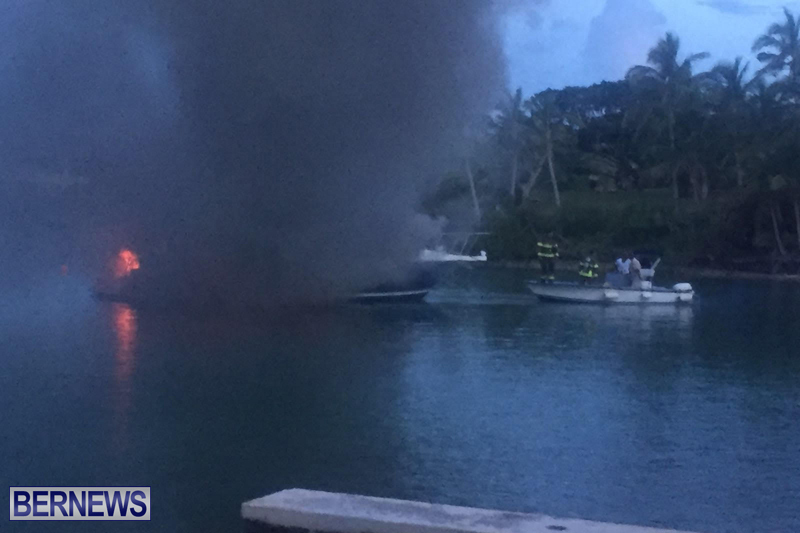 Fire Service spokesperson Sergeant Russann Francis said, “We responded to a 40′ boat that was fully involved in fire and producing heavy smoke near the Wreck Road in Sandys.The Fire Service responded to the incident with a team of 8 firefighters who fought through challenges to extinguish the fire. Update Aug 22, 11.09am: A Bermuda Maritime Operations Centre spokesperson said, “On Sunday, August 21 2016 at 7.29pm, Bermuda Radio received a VHF call from a member of the public reporting that a 40ft vessel was on fire at its mooring in Ely’s Harbour. “The initial caller reported that the vessel owner was in the vicinity, having disembarked the vessel a short while earlier, reporting that no other persons were on-board the vessel. 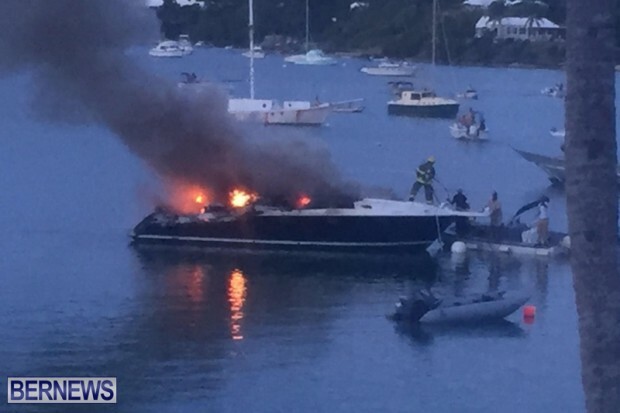 Bermuda Maritime Operations Centre contacted the Bermuda Fire & Rescue Service [BFRS] and Bermuda Police Service in an effort to tackle blaze and deal with onsite response efforts, including use of vessels in the area to assist with transportation of BFRS teams from shore. 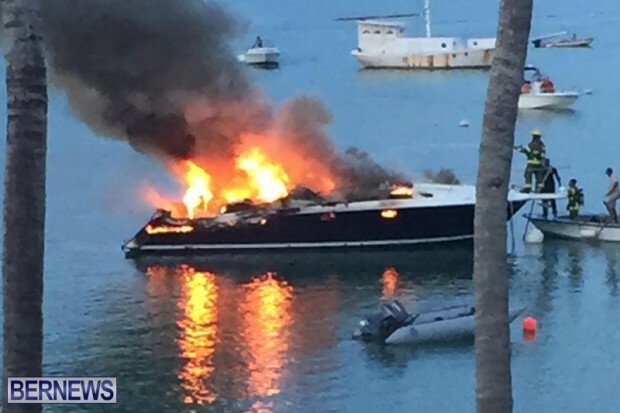 “The vessel, later identified as ‘Midnite 2 Dawn’, was beached in the area as BFRS continued with firefighting efforts, extinguishing the blaze a short while later. What a shame looks like it was a nice boat. 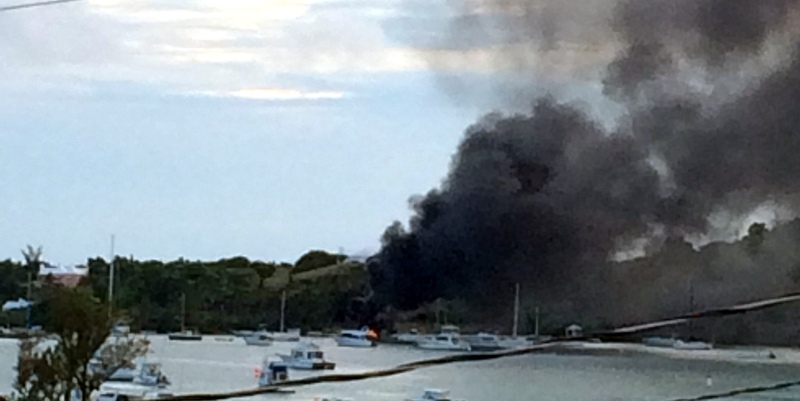 Hope the owner is ok.
Looks very challenging for the fighters indeed!